I often joke that no outfit is complete without a little pet hair. I mean, with a black dog, a white and brown dog, and a gray cat, finding fur on my clothes — even if those are clothes that I washed, packed immediately, and put on in a hotel room in another city — is pretty much a fact of life. Super cute, right? Also SUPER FURRY. Even though I’m not too bothered by a hair or two on the carpet, I don’t particularly love seeing tumbleweeds of fur floating across my kitchen. And make no mistake — if I don’t keep up with the fur situation around here, that’s exactly what will happen. Dust bunnies got nothin’ on the balls of hair my trio is capable of creating within the span of a week. 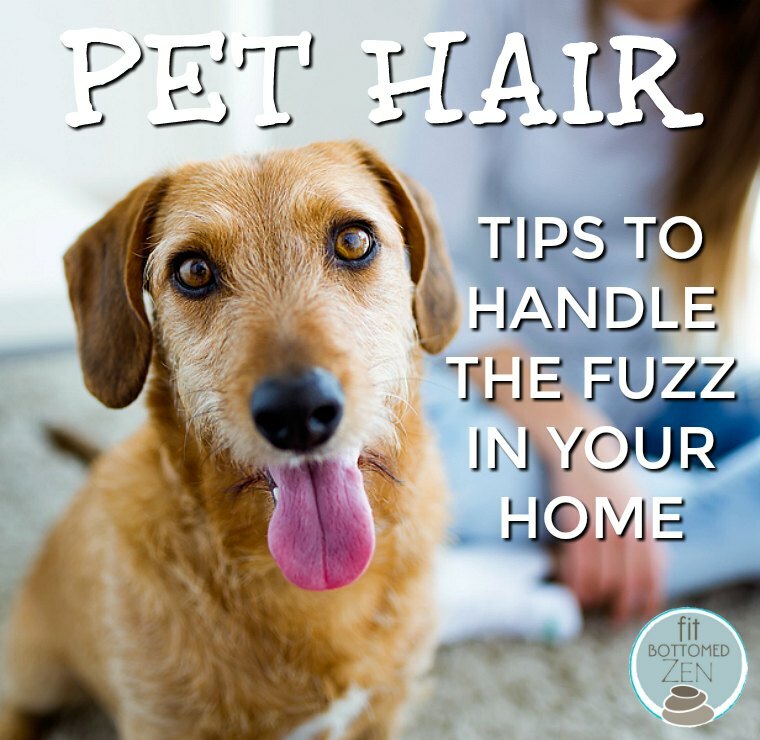 Here’s how I keep my home from being overtaken with floating fuzz, although, one note first — if you notice a big change in your pet’s shedding, it’s smart to check in with your vet. The change of seasons can be a major factor, but there are a number of health conditions that can also cause shedding. Brush and bathe ’em. Okay, fine — I actually don’t do this as much as I should (especially the bathing part), but when I make a point to brush my dogs regularly, it makes a huge difference. My black Lab mix, Rudi, has all of this downy underfur that will start coming out in actual tufts if she hasn’t been brushed recently enough, and a single petting session can end with a layer of black fur surrounding the area in question. The best method I’ve found is to do a solid brushing session, then bathe, and then, once the dog is dry, brush again. Or take your pooch to the groomer. You do you. Keep in mind that different types of brushes and tools work best on different types of fur — you’d have to pry my FURminator DeShedding Tool from my cold dead hands in order to get it away from me because of how useful it is on Rudi. (Yes, it’s pricey but it’s something I’ve purchased, lost, and replaced at full price if that tells you anything.) For Trixie, my cat, I’m better off using something softer, like the Groom Genie I received to review a couple of years ago — she enjoys it and it’s effective, so, win/win. Vacuum regularly — the smart way. You’ve gotta vacuum. I wish I had a magic solution for you that meant you could wish the fur away, but I don’t. I do, however, have the next best things in terms of product suggestions to make your life a whole lot easier. First up is the BLACK+DECKER PET Lithium Robotic Vacuum, which I received to review a couple of weeks ago and, whoa is it a game changer. I had a robotic vacuum ages ago, and it was always getting stuck and required emptying every few minutes. That’s not the case here. It has an really large dustbin so I can let it run for quite a while before it requires my attention. It covers a surprisingly wide area, adjusts suction from hard flooring to carpet, and lets you program a cleaning schedule via an app. Most exciting as far as my husband is concerned, though, is that you can also drive it from the app. 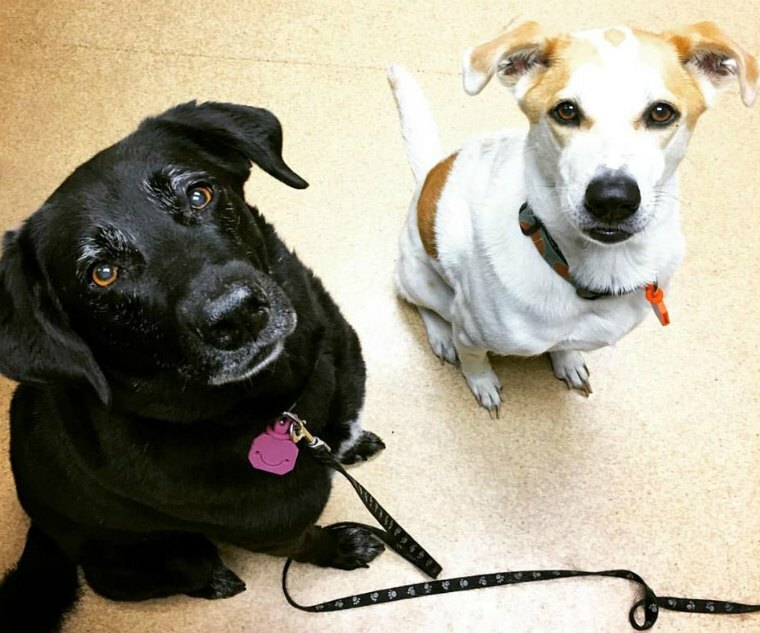 And, if you’re worried about it freaking your pets out … well, I can’t say you don’t have to worry, but I can share that my animals (who dislike the vacuum in general) are amazingly chill about it. The robot literally runs into Rudi while she’s laying on the floor and she only bothers to get up half the time, and Trixie seems genuinely curious about it. I mean, I caught her hanging out with it while it was docked, and she doesn’t run away when it starts up. I suspect she thinks she’s made a friend. Now, while I LOVE my new robot (which really needs a name, huh? ), I have to say that I can’t get away with it being the only vacuum in the house. It does a great job on hard surfaces and a really decent job on the surface of my rugs, but in order to get allll the dirt and ground in fur, I need to use something with a bit more power. I landed a Dyson V8 Animal to review a few years ago and quickly learned that having a cordless vacuum makes a big difference to me. I don’t use the attachments as much as other people I know do, but they’re handy to have. If I had a home full of carpet, I’d opt for something with a larger dustbin, but for my needs (tile, a couple of rugs, two rooms with carpet) it’s amazing and versatile and I’ve probably recommended it 100 times over to friends and family. Want to know what my other must-have tool is? Nope, it’s not another vacuum that runs in the triple digits — it’s a pair of rubber gloves. Yep, like the ones you wear to wash dishes. If you have fur that’s settled on your furniture or fabric and it just seems stuck, run your gloved hand over it and see how much just rolls right up into a ball. Amazing, right? Cover what you can. If your dog loves to doze in a certain corner of the room or your cat is always curled up in the same chair, consider putting a pet bed or a fuzzy, cozy throw in that spot. Be sure to pick a bed with an easy-to-remove, machine-washable cover — and you might even want to have a couple on hand so you can put a clean cover on while washing the other. Thank you for sharing! I have a sweet little black lab, Yoshi, who is 3 and her hair is EVERYWHERE. The worst is when it ends up on dinner plates 🙁 We’ve gotten better about brushing her, but could probably bathe her more. We have a nice little brush from Amazon that works well for hair on the couch, but I’ll definitely try the rubber gloves! Great tips. I have Sera(black lab-10yr), Kya(german shepherd-6yr) and Leopold(tabby cat-14yr). I got Sera for my second husband who always wanted a puppy and then left her with me when he left. Kya had been rescued from a junkyard and was a skinny malnourished scared pup when she was given to my neighbor. I took Kya from my neighbor who could not deal with her after her own dog and husband died of cancer within 2 months. Leo was taken from a co-worker who after spending $1200 to save a sick kitten, get him spade and declawed found out her baby was allergic to cats. I have always loved animals and intended to become a veterinarian. That didn’t happen but I love being a Respiratory Therapist. I decided that after these pets die I want to be a foster mom for older less likely to be adopted shelter dogs.